"White beans are cooked in a slow cooker with smoked neck bones, aromatic vegetables, seasonings, and chicken broth. This recipe can be used for cooking most any dried bean in the slow cooker. 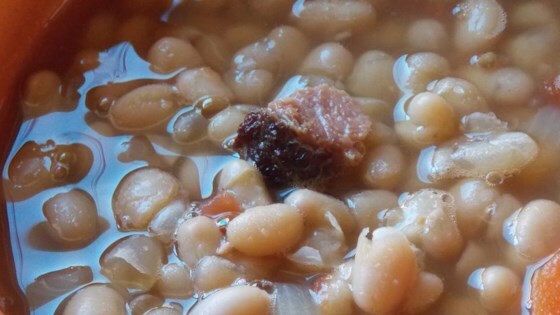 Adjust liquid when cooking tougher skin beans (such as pinto beans). Add garlic and onion powder to taste, if desired." Place beans into a large container and cover with several inches of cool water; let stand 8 hours to overnight. Drain and rinse. Place neck bones in a slow cooker and pour chicken broth over the top; stir in soul seasoning. Cook on High until meat is falling off the bones, about 1 hour. Transfer bones and meat to a plate and shred meat from bones; discard bones. Stir beans, onion, vinegar, sugar, and hot sauce into slow cooker; spread shredded meat over beans. Cook on High for 2 to 4 hours (or cook on Low for 4 to 6 hours). A set it and forget it, perfect side dish for your Thanksgiving table. Nice and easy bean soup. I added carrots and celery because we like them and it seems to add a little something more to the beans. Thank you I really like this bean soup!! I did replace the neck bones with ham hocks and use cayenne pepper instead of the hot sauce.